Mom’s making Buckeyes and Walnut Chocolate Fudge! I wish you could all get a whiff of the Chocolate aroma in the kitchen today! Mom is making her area famous yearly batches of Buckeyes and Walnut Chocolate Fudge! Everyone that’s had the Buckeyes are of the same opinion, the best they’ve ever had! The thing that sets these apart from other Buckeye Candies is the Rice Krispies she adds. So if you’re looking for a Buckeye Candy Recipe, look no further. Same with the Walnut Fudge, such a creamy, deep and rich Chocolate taste! The bad part is neither is Diabetic Friendly, but I’ll still have a half a piece of each from time to time. And both make perfect Christmas Gift that everyone enjoys! It’s that time of year when the requests start coming in for my Mom’s Buckeyes. Back when I was working I was everyone’s favorite person when I would bring in a batch of my Mom’s Buckeyes. It’s been 15 years since I lost my leg to melanoma cancer and unable to work but to this day I still get request’s from fellow past workers for my Mom’s Buckeyes. It seems that everyone that has had them all say the same thing “The best Buckeyes I’ve ever had!” I think it’s the Rice Krispies that sets them apart from other Buckeye Candies. When you make a batch of these and try them I’m sure you’ll agree, let me know! These are not diabetes friendly but they are delicious. We tried making them by using reduced fat Peanut Butter and Sugar Free Chocolate but they just didn’t come out the same. * Chill the mixture for at least 2 hours. * Then take the mixture and roll into individual balls. The size can vary no set size. * Melt all the Chocolate and Paraffin Wax in a double broiler or in a sauce pan on low heat stirring until smooth. * With one or two forks dip each of the balls into the Chocolate/Wax. Drain excess off the balls and place on a sheet pan covered with wax paper and refrigerate for several hours until Chocolate has hardened into a shell covering the balls. Well like the Buckeye recipe above this ones not so Diabetic friendly but they sure are good! You can make it a somewhat lower in calories and carbs by using Splenda instead of the Sugar it calls for. This is a great Fudge recipe. My Mom has made this for as long as I can remember. Hope you enjoy it as much as all of us. Enjoy! Combine Sugar, Margarine, and Evap. Milk in a large pot and heat to a boil for 5 minutes, stirring frequently. Remove from heat and add Chocolate Chips, Marshmallow Cream, Nuts, and Vanilla stirring till well mixed. Pour mixture into a greased 13×9 pan. Refrigerate until firm. Cut into desired size pieces. * You may be tempted to leave the heat on while stirring the chips. While this would normally be ok, you really shouldn’t do that in this recipe. If the mixture stays at a boiling temperature, you may be in for a nasty surprise when you add the vanilla. Bottom line: it’s safer for you and better for the fudge if the mixture cools down just a tad before the vanilla goes in. As long as you keep stirring, the chips will melt just fine. It’s the most wonderful time of the year, for snacks and appetizers! It’s just not the Christmas Holiday without my Mom’s Christmas Chex Mix! Absolutely love this! Such a great combination of ingredients – Chex Cereals, Pretzels, and the Seasonings. They say to let it cool, I love it when it first comes out of the oven and just letting cool for a couple of minutes. Enjoy, I know we do! Pre heat oven to 250 degrees F.
1 – In large bowl, mix the cereals, mixed nuts and,pretzels. Set aside. 2 – Melt the butter in a bowl (I normally do the full 2 1/2 sticks) and mix in the Worcestershire sauce, seasoned salt, garlic powder, onion powder and a good pinch of pepper. Pour the butter over the cereal mixture, tossing well for 3-5 minutes or until the cereal mixture is evenly coated. 3 – Bake 1 hour, stirring every 15 minutes. Spread on paper towels to cool, about 15 minutes (or just start eating!!). Store in airtight container. It’s just not the Christmas Holiday without my Mom’s Christmas Chex Mix! Absolutely love this! Such a great combination of ingredients – Chex Cereals, Pretzels, and the Seasonings. They say to let it cool, I love it when it first comes out of the oven and just letting cool for a couple of minutes. Enjoy, I know we do! If you gotta snack, snack with a low calorie snack! All from the Eating Well web site! Don’t let yourself get so famished that you can’t help dipping into the office candy bowl or stopping at a vending machine. Choosing the right snacks can actually help you lose weight, by helping you manage your hunger so you don’t overeat. Don’t banish snacking altogether—these easy, healthy 100-calorie snack recipes will satisfy your snack cravings while keeping you slim. Low-calorie snack recipes, including recipes for smoothies, popcorn, dips and more. Having a snack attack? Stock your fridge and pantry with ingredients for these quick, healthy and low-calorie snack recipes to help you stay lean and healthy—and avoid the candy dish and snacks at work. Enjoy our healthy snack recipes, which are perfect to grab and go or pack for the office. Kids will love dipping bananas in melted chocolate and rolling them in coconut to make this tasty frozen treat…..
Make your own flavored cream cheese by stirring in fresh, in-season cherries. We like the flavor of black cherries, but any kind will work. Spread this on your morning bagel or sandwich it between graham crackers for a cherry cheesecake-inspired snack……. Freshly grated Parmesan cheese and a sprinkle of cayenne pepper dress up air-popped popcorn…..
Salt homemade potato chips by putting them in a paper bag with salt and shaking. This way, the salt is evenly distributed-and the paper absorbs the excess grease. Save calories wherever you can! Popcorn, also known as popping corn, is a type of corn (maize, Zea mays var. everta) that expands from the kernel and puffs up when heated. Corn is able to pop because, like amaranth grain, sorghum, quinoa and millet, its kernels have a hard moisture-sealed hull and a dense starchy interior. This allows pressure to build inside the kernel until an explosive “pop” results. Some strains of corn are now cultivated specifically as popping corns. The kernels are sometimes different than others. There are many techniques for popping corn. Commercial large-scale popcorn machines were invented by Charles Cretors in the late 19th century. Many types of small-scale home methods for popping corn also exist, with the most popular in the United States being prepackaged. Depending on how it is prepared and cooked, some consider it to be a health food while others caution against it for a variety of reasons. Popcorn can also have non-food applications, ranging from holiday decorations to packaging materials. Popcorn was first discovered thousands of years ago by Native Americans. It is one of the oldest forms of corn: evidence of popcorn from 3600 B.C. was found in New Mexico and even earlier evidence dating to perhaps as early as 4700 BC was found in Peru. Some Popcorn has been found in early 1900s to be a purple color. During the Great Depression, popcorn was comparatively cheap at 5–10 cents a bag and became popular. Thus, while other businesses failed, the popcorn business thrived and became a source of income for many struggling farmers. During World War II, sugar rations diminished candy production, causing Americans to eat three times as much popcorn than they had before. At least six localities (all in the Midwestern United States) claim to be the “Popcorn Capital of the World”: Ridgway, Illinois; Valparaiso, Indiana; Van Buren, Indiana; Schaller, Iowa; Marion, Ohio; and North Loup, Nebraska. According to the USDA, most of the corn used for popcorn production is specifically planted for this purpose; most is grown in Nebraska and Indiana, with increasing area in Texas. employs specially designed popcorn machines, which were invented in Chicago, Illinois, by Charles Cretors in 1885. Cretors successfully introduced his invention at the Columbian Exposition in 1893. At this same world’s fair, F.W. Rueckheim introduced a molasses-flavored “Candied Popcorn”, the first caramel corn; his brother, Louis, slightly altered the recipe and introduced it as Cracker Jack popcorn in 1896. 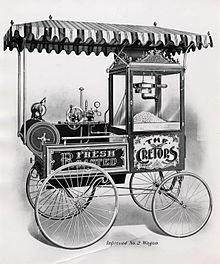 Cretors’s invention introduced the first patented steam-driven popcorn machine that popped corn in oil. Previously, vendors popped corn by holding a wire basket over an open flame. At best, the result was a hot, dry, unevenly cooked snack. Cretors’s machine popped corn in a mixture of one-third clarified butter, two-thirds lard, and salt. This mixture could withstand the 450 °F (232 °C) temperature needed to pop corn and it did without producing much smoke. A fire under a boiler created steam that drove a small engine; that engine drove the gears, shaft, and agitator that stirred the corn and powered a small automated clown puppet-like figure, “the Toasty Roasty Man”, an attention attracting amusement intended to drum up business. A wire connected to the top of the cooking pan allowed the operator to disengage the drive mechanism, lift the cover, and dump popped corn into the storage bin beneath. Exhaust from the steam engine was piped to a hollow pan below the corn storage bin and kept freshly popped corn uniformly warm for the first time ever. A very different method of popcorn-making can still be seen on the streets of some Chinese cities today. The un-popped corn kernels are poured into a large cast-iron canister — sometimes called a ‘popcorn hammer’ — that is then sealed with a heavy lid and slowly turned over a curbside fire in rotisserie fashion. When a pressure gauge on the canister reaches a certain level, the canister is removed from the fire, a large canvas sack is put over the lid, and the seal is released. With a huge boom, all of the popcorn explodes at once and is poured into the sack. This method is believed to have been developed during the Song dynasty originally for puffing rice. Individual consumers can also buy and use specialized popping appliances that typically generate no more than a gallon of popped corn per batch. 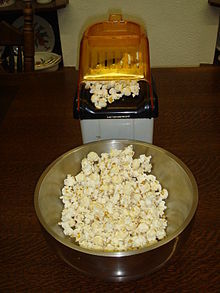 Some of these appliances also accept a small volume of oil or melted butter to assist thermal transfer from a stationary heating element, but others are “air poppers” which rapidly circulate heated air up through the interior, keeping the un-popped kernels in motion to avoid burning and then blowing the popped kernels out through the chute. The majority of popcorn sold for home consumption is now packaged in a microwave popcorn bag for use in a microwave oven. Popping results are sensitive to the rate at which the kernels are heated. If heated too quickly, the steam in the outer layers of the kernel can reach high pressures and rupture the hull before the starch in the center of the kernel can fully gelatinize, leading to partially popped kernels with hard centers. Heating too slowly leads to entirely unpopped kernels: the tip of the kernel, where it attached to the cob, is not entirely moisture-proof, and when heated slowly, the steam can leak out of the tip fast enough to keep the pressure from rising sufficiently to break the hull and cause the pop. Producers and sellers of popcorn consider two major factors in evaluating the quality of popcorn: what percentage of the kernels will pop, and how much each popped kernel expands. Expansion is an important factor to both the consumer and vendor. For the consumer, larger pieces of popcorn tend to be more tender and are associated with higher quality. For the grower, distributor, and vendor, expansion is closely correlated with profit: vendors such as theaters buy popcorn by weight and sell it by volume. For both these reasons, higher-expansion popcorn fetches a higher profit per unit weight. popcorn. Kernels with a high moisture content are also susceptible to mold when stored. For these reasons, popcorn growers and distributors dry the kernels until they reach the moisture level at which they expand the most. This differs by variety and conditions, but is generally in the range of 14–15% moisture by weight. If the kernels are over-dried, the expansion rate will suffer and the percentage of kernels that pop at all will decline. Two explanations exist for kernels which do not pop at proper temperatures, known in the popcorn industry as “old maids”. The first is that unpopped kernels do not have enough moisture to create enough steam for an explosion. The second explanation, according to research led by Dr. Bruce Hamaker of Purdue University, is that the unpopped kernel may have a leaky hull. Popcorn varieties are broadly categorized by the shape of the kernels, the color of the kernels, or the shape of the popped corn. 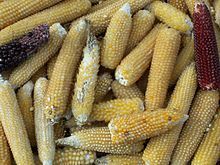 While the kernels may come in a variety of colors, the popped corn is always off-yellow or white as it is only the hull (or pericarp) that is colored. “Rice” type popcorns have a long kernel pointed at both ends; “pearl” type kernels are rounded at the top. Commercial popcorn production has moved mostly to pearl types. Historically, pearl popcorns were usually yellow and rice popcorns usually white. Today both shapes are available in both colors, as well as others including black, red, and variegated. Commercial production is dominated by white and yellow. In popcorn jargon, a popped kernel of corn is known as a “flake”. Two shapes of flakes are commercially important. “Butterfly” flakes are irregular in shape and have a number of protruding “wings”. “Mushroom” flakes are largely ball-shaped, with few wings. Butterfly flakes are regarded as having better mouthfeel, with greater tenderness and less noticeable hulls. Mushroom flakes are less fragile than butterfly flakes and are therefore often used for packaged popcorn or confectionery, such as caramel corn. The kernels from a single cob of popcorn may form both butterfly and mushroom flakes; hybrids that produce 100% butterfly flakes or 100% mushroom flakes exist, the latter developed only as recently as 1998. Growing conditions and popping environment can also affect the butterfly-to-mushroom ratio. Popcorn is commonly eaten in movie theaters. This snack is usually served salted or sweetened. In North America, it is traditionally served salted, often with butter or a butterlike topping. However, sweetened versions, such as caramel corn and kettle corn, are also commonly available. In the United Kingdom, ready-made popcorn is available either salted or simply sweetened with sugar. Toffee (i.e. caramel) popcorn is also available, but tends to be more expensive. In Peru popcorn is sometimes sweetened with small candy pellets and sweetened condensed milk, but its more often eaten with salt and the only buttered version known to any considerable degree is the microwave popcorn. Popcorn is a popular snack food at sporting events and in cinemas, where it has been served since 1912. The Boy Scouts of America sell popcorn door-to-door as a primary fundraiser, similar to Girl Scout cookies. Air-popped popcorn is naturally high in dietary fiber, low in calories and fat, and free of sugar and sodium. This can make it an attractive snack to people with dietary restrictions on the intake of calories, fat, and/or sodium. For the sake of flavor, however, large amounts of fat, sugar, and sodium are often added to prepared popcorn, which can quickly convert it to a very poor choice for those on restricted diets. One particularly notorious example of this first came to public attention in the mid-1990s, when the Center for Science in the Public Interest produced a report about “Movie Popcorn”, which became the subject of a widespread publicity campaign. The movie theaters surveyed used coconut oil to pop the corn, and then topped it with butter or margarine. “A medium-size buttered popcorn”, the report said, “contains more fat than a breakfast of bacon and eggs, a Big Mac and fries, and a steak dinner combined.” The practice continues today. For example, according to DietFacts.com, a small popcorn from Regal Cinema Group (the largest theater chain in the United States still contains 29 g of saturated fat, as much as three Big Macs and the equivalent of a full day-and-a-half’s reference daily intake. Popcorn is included on the list of foods that the American Academy of Pediatrics recommends not serving to children under four, because of the risk of choking. Special “hull-less” popcorn has been developed that offers an alternative for small children and for people with braces or other dental problems who may otherwise need to avoid popcorn. common artificial-butter flavorants, diacetyl, has been implicated in causing respiratory ailments. Popcorn, threaded onto a string, is used as a wall or Christmas tree decoration in some parts of North America, as well as on the Balkan peninsula. Some shipping companies have experimented with using popcorn as a biodegradable replacement for expanded polystyrene packing material. However, popcorn has numerous undesirable properties as a packing material, including attractiveness to pests, flammability, and a higher cost and greater density than expanded polystyrene. A more processed form of expanded corn foam has been developed to overcome some of these limitations. The world’s largest popcorn ball was unveiled in October 2006 in Lake Forest, Illinois. It weighed 3,415 pounds, measured 8 feet (2.4 m) in diameter, and had a circumference of 24.6 ft.
Singapore, South African, Jamaican English and as either chips or wafers in Indian English) are thin slices of potato that are deep fried or baked. 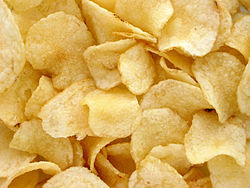 Potato chips are commonly served as an appetizer, side dish, or snack. The basic chips are cooked and salted; additional varieties are manufactured using various flavorings and ingredients including seasonings, herbs, spices, cheeses, and artificial additives. Crisps, however, refer to many different types of snack products in the UK and Ireland, some made from potato, but may also be made from maize and tapioca. An example of these kinds of crisps is Monster Munch. Potato chips are a predominant part of the snack food market in English-speaking countries and numerous other Western nations. The global potato chip market generated total revenues of US$16.4 billion in 2005. This accounted for 35.5% of the total savory snacks market in that year (US$46.1 billion). According to a traditional story, the original potato chip recipe was created in Saratoga Springs, New York on August 24, 1853. Agitated by a patron repeatedly sending his fried potatoes back because they were too thick, soggy and bland, resort hotel chef, George Crum, decided to slice the potatoes as thin as possible, frying them until crisp and seasoning them with extra salt. Contrary to Crum’s expectation, the patron (sometimes identified as Cornelius Vanderbilt) loved the new chips and they soon became a regular item on the lodge’s menu under the name “Saratoga Chips“. Alternative explanations of the provenance of potato chips date them to recipes in Shilling Cookery for the People by Alexis Soyer (1845) or Mary Randolph’s The Virginia House-Wife (1824). In the 20th century, potato chips spread beyond chef-cooked restaurant fare and began to be mass produced for home consumption. The Dayton, Ohio-based Mike-sell’s Potato Chip Company, founded in 1910, calls itself the “oldest potato chip company in the United States“. New England-based Tri-Sum Potato Chips, originally founded in 1908 as the Leominster Potato Chip Company, in Leominster, Massachusetts claim to be America’s first potato chip manufacturer. Chips sold in markets were usually sold in tins or scooped out of storefront glass bins and delivered by horse and wagon. The early potato chip bag was wax paper with the ends ironed or stapled together. At first, potato chips were packaged in barrels or tins, which left chips at the bottom stale and crumbled. Laura Scudder, an entrepreneur in Monterey Park, California started having her workers take home sheets of wax paper to iron into the form of bags, which were filled with chips at her factory the next day. This pioneering method reduced crumbling and kept the chips fresh and crisp longer. This innovation, along with the invention of cellophane, allowed potato chips to become a mass market product. Today, chips are packaged in plastic bags, with nitrogen gas blown in prior to sealing to lengthen shelf life, and provide protection against crushing. crisps in greaseproof paper bags, which were then sold around London. The potato chip remained otherwise unseasoned until an innovation by Joe “Spud” Murphy (1923–2001), the owner of an Irish crisp company called Tayto, who developed a technology to add seasoning during manufacture in the 1950s. After some trial and error, Murphy and his employee, Seamus Burke, produced the world’s first seasoned crisps, Cheese & Onion and Salt & Vinegar. The innovation became an overnight sensation in the food industry with the heads of some of the biggest potato chip companies in the United States traveling to the small Tayto company in Ireland to examine the product and to negotiate the rights to use the new technology. Companies worldwide sought to buy the rights to Tayto’s technique. The sale of the Tayto company made the owner and the small family group, who had changed the face of potato chip manufacturing, very wealthy. The Tayto’s innovation changed the entire nature of the potato chip, and led to the end of Smith’s twist of salt. (Walkers revived the idea of “salt in a bag”, following their takeover of Smith’s (UK) in 1979, with their Salt ‘n’ Shake potato crisps. Later chip manufacturers added natural and artificial seasonings to potato chips with varying degrees of success. A product that had had a large appeal to a limited market on the basis of one seasoning now had a degree of market penetration through vast numbers of seasonings. Various other seasonings of chips are sold in different locales, including the original Cheese and Onion, produced by Tayto, which remains by far Ireland’s biggest manufacturer of crisps. There is little consistency in the English speaking world for names of fried potato cuttings. American and Canadian English use “chips” for the above mentioned dish—this term is also used (but not universally) in other parts of the world, due to the influence of American culture—and sometimes “crisps” for the same made from batter. and served hot. In Australia, some parts of South Africa, the south of New Zealand, India, the general West Indies especially in Barbados, both forms of potato product are simply known as “chips”, as are the larger “home-style” potato crisps. In the north of New Zealand they are known as “chippies” but are marketed as “chips” throughout the country. Sometimes the distinction is made between “hot chips” (fried potatoes) and “potato chips” in Australia and New Zealand. 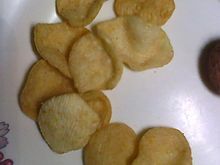 In Bangladesh, they are generally known as chip or chips, and much less as crisps (pronounced “kirisp”) and locally Álu Bhaja. Another type of potato chip, notably the Pringles and Lay’s Stax brands, is made by extruding or pressing a dough made from ground potatoes into the desired shape before frying. This makes chips that are very uniform in size and shape, which allows them to be stacked and packaged in rigid tubes. In America, the official term for Pringles is “potato crisps”, but they are rarely referred to as such. Conversely Pringles may be termed “potato chips” in Britain, to distinguish them from traditional “crisps”. An additional variant of potato chips exists in the form of “potato sticks”, also called “shoestring potatoes”. These are made as extremely thin (2–3 mm) versions of the popular French fry, but are fried in the manner of regular salted potato chips. A hickory-smoke flavor version is popular in Canada, going by the vending machine name “Hickory Sticks”. Potato sticks are typically packaged in rigid containers, although some manufacturers use flexible pouches, similar to potato chip bags. Potato sticks were originally packed in hermetically sealed steel cans. In the 1960s, manufacturers switched to the less expensive composite canister (similar to the Pringle’s container). Reckitt Benckiser was a market leader in this category under the Durkee Potato Stix and French’s Potato Sticks names, but exited the business in 2008. A larger variant (approximately 1 cm thick) made with dehydrated potatoes is marketed as Andy Capp’s Pub Fries, using the theme of a long-running British comic strip, which are baked and come in a variety of flavors. Walkers make a similar product called “Chipsticks” which are Salt and Vinegar flavored. The Ready Salted flavor had been discontinued. The success of crisp fried potato chips also gave birth to fried corn chips, with such brands as Fritos, CC’s and Doritos dominating the market. “Swamp chips” are similarly made from a variety of root vegetables, such as parsnips, rutabagas and carrots. Japanese-style variants include extruded chips, like products made from rice or cassava. In South Indian snack cuisine, there is an item called HappLa in Kannada/vadam in Tamil, which is a chip made of an extruded rice/sago or multigrain base that has been around for many centuries. There are many other products which might be called “crisps” in Britain, but would not be classed as “potato chips” because they aren’t made with potato and/or aren’t chipped (for example, Wotsits, Quavers, Skips, Hula Hoops and Monster Munch). Kettle-style chips (known as hand-cooked in the UK/Europe) are traditionally made by the “batch-style” process, where all chips are fried all at once at a low temperature profile, and continuously raked to prevent them from sticking together. There has been some development recently where kettle-style chips are able to be produced by a “continuous-style” process (like a long conveyor belt), creating the same old-fashioned texture and flavor of a real kettle-cooked chip. Non-potato based chips also exist. Kumara (sweet potato) chips are eaten in Korea, New Zealand and Japan; parsnip, beetroot and carrot crisps are available in the United Kingdom. India is famous for a large number of localized ‘chips shops’, selling not only potato chips but also other varieties such as plantain chips, tapioca chips, yam chips and even carrot chips. Plantain chips, also known as chifles or tostones, are also sold in the Western Hemisphere from Canada to Chile. In the Philippines, banana chips can be found sold at local stores. In Kenya, chips are made even from arrowroot and casava. In the United Kingdom, Sweden, Finland and Australia, a new variety of Pringles made from rice have been released and marketed as lower in fat than their potato counterparts. Recently, the Australian company Absolute Organic has also released chips made from beetroot. I seen these advertised yesterday and while at Meijer earlier seen that they had them in stock and purchased a box. Glad I did, great tasting Chip! They had 4 different kinds and I went with the Cheddar, I’m a Cheese lover! Very good tasting chip. Crisp and good size chips. The good part only 110 calories and 22 carbs for 27 of them. 13 would be plenty for a snack or to go with your sandwich so you could cut those totals in half. Found a new snack! Mmmm…Cheddar! 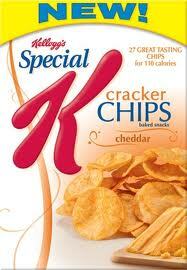 Introducing new Special K® Cheddar Cracker Chips. They’re not quite a cracker and not just a chip, with a crunch that really satisfies your salty snack craving! They’re delightfully seasoned with delicious cheddar cheese, and best of all, they’re 110 calories for 27 cracker chips. Feel free to indulge! Find them in the cracker aisle. My one snack/food weak point is Peanut Butter! As I was enjoying my daily tablespoon of Jif Reduced Peanut Butter I was wondering about the origin of Peanut Butter. So here’s a little background on one of my favorites Peanut Butter. Peanut butter is a food paste made primarily from ground dry roasted peanuts, popular in North America, Netherlands, United Kingdom, and parts of Asia, particularly the Philippines and Indonesia. It is mainly used as a sandwich spread, sometimes in combination as in the peanut butter and jelly sandwich. The United States and China are leading exporters of peanut butter. Other nuts are used as the basis for similar nut butters. Peanuts are native to the tropics of the Americas and were mashed to become a pasty substance by the Aztec Native Americans hundreds of years ago. 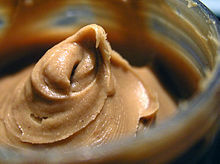 A number of peanut paste products have been used over the centuries, and the distinction between peanut paste and peanut butter is not always clear in ordinary use. Early forms of peanut butter, like the Aztecs’ version, were nothing but pure roasted peanut paste. It may have been harder to work with and spread than regular peanut butter, less creamy and less sweet. Vegetable oil was also later added to most brands to aid in its spreadability, but with new modern processing machines being invented, the peanut butter was already significantly smoother than it had been. Peanut butter was invented and reinvented many times during history. Peanuts were known as early as 950 B.C. and originated in South America. The ancient Incas used peanuts and were known to have made it into a paste-like substance. As a crop peanuts emigrated from South America to Africa by early explorers and then traveled by trade into Spain who then traded the product to the American colonies. The first commercial peanut crop was grown in Virginia in the early to mid 1840’s and in North Carolina beginning around 1818. Evidence of peanut butter as it is known today comes from U.S. Patent 306,727, issued in 1884 to Marcellus Gilmore Edson of Montreal, Quebec, Canada, for the finished product of the process of milling roasted peanuts between heated surfaces until the peanuts entered “a fluid or semi-fluid state.” As the peanut product cooled, it set into what Carter explained as being “a consistency like that of butter, lard, or ointment.” Edson’s patent is based on the preparation of a peanut paste as an intermediate to the production the modern product we know as peanut butter, it does show the initial steps necessary for the production of peanut butter. George Washington Carver is often credited with inventing peanut butter and is nearly synonymous with its history in the United States. Dr. Ambrose Straub, a physician in St. Louis, Missouri, pursued a method for providing toothless elderly with protein in the 1890s. His peanut-butter-making machine was patented in 1903. Peanut butter has a high level of monounsaturated fats and resveratrol. Peanut butter (and peanuts) provide protein, vitamins B3 and E, magnesium, folate, dietary fiber, arginine, and high levels of the antioxidant p-coumaric acid. A slang term for peanut butter in World War II was “monkey butter“.